In 2009, I was a new member of the Board overseeing the Central Arizona Project (CAP) and energy, not water, was the primary focus. I was surprised with my sudden immersion into the ins and outs of energy. Yet, there was a good reason for concentrating on energy. As one of the largest energy users in the state, energy is crucial for CAP. CAP needs to pump water uphill from the Colorado River through the 336-mile canal that delivers water to cities, Native American communities, and farmers in Central Arizona and south to Tucson. 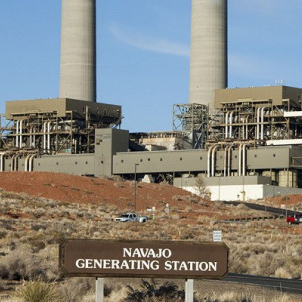 Since the 1970s, nearly 90 percent of CAP's primary energy source has been the Navajo Generating Station (NGS) in Page, Arizona near the Utah border. The plant is one of the country's largest coal-fired power plants. So in 2009 and 2010, the U.S. Environmental Protection Agency pushed hard to reduce the haze NGS produced in the scenic Four Corners area. It was estimated that NGS would need over a billion dollars in capital investment to reduce nitrogen oxide emissions to EPA’s satisfaction. Many felt EPA’s unspoken aim was to shut down NGS. CAP and the Salt River Project (SRP), the operator and part owner of the plant, took this attack on NGS seriously. It was frightening to think of NGS shutting down or being forced to take on huge capital costs to meet EPA’s regulatory demands. The rallying cry was that NGS was critical to make sure CAP had power to operate and to keep energy costs low. At the time, many prominent voices correctly observed that keeping NGS open was important to Arizona’s economy, particularly to the City of Page and the surrounding Navajo Nation. NGS also provided CAP with a key revenue source. CAP sells surplus energy produced by the plant and uses the revenue to repay the federal government the loan it made to finance the construction of the CAP. A concerted effort was made to find a compromise that EPA would accept to keep NGS open until 2044. To the relief of many, in July 2014 the EPA and owners of NGS reached an agreement that would lower the levels of nitrogen oxide emission and keep NGS open until 2044. So fast-forward three years to today. Many of us who followed the NGS story since 2009 are surprised with the news that the owners of NGS voted to close the power plant at the end of 2019. What has caused the 180-degree turn in the effort to save NGS? Pure economics is driving the decision. The utilities that own NGS now are dealing with a power plant that is significantly more expensive than other energy options. Natural gas prices have dropped to record lows to become a viable long-term and economical alternative to coal power. This means pursuing the regulatory upgrades that were part of the compromise with EPA are even less cost-effective today. However, even if EPA loosened its coal regulations, the energy industry is headed towards having natural gas generation as the fuel of choice for many years to come. So what does this mean to Arizona and particularly the Valley cities that utilize CAP? First and foremost, CAP will have access to the energy necessary to move water through the CAP system even without NGS. In recent years, CAP has been looking at alternatives to NGS to be prepared for what is now happening. CAP can easily buy energy from the open-market power grid. Based on today’s energy market, CAP’s power costs would actually be significantly lower. Energy costs on the open market are much less than the cost to generate power at the NGS. This means CAP’s pumping energy rate - charged to the Phoenix area cities and others CAP users - will decrease. Again, this new economic reality of the energy market is much different than just seven years ago when we were worried that an NGS closure would mean higher costs for CAP and its customers. NGS has been a reliable energy source for CAP. While going on the open energy market will mean lower costs today, CAP faces the new challenge of how to best utilize the right energy sources to take advantage of low-cost power alternatives. While the decision to close NGS is not the dire situation we assumed it would be in 2009 and 2010, the closure of NGS still remains an enormous challenge for the Navajo Nation, Hopi Tribe and the community of Page. NGS has been a primary economic driver and major employer. Assuming the Navajo Nation extends the existing land lease for the plant through the end of 2019, the plant’s owners should have time to explore ideas to lessen the negative impact to that region. The decision of the utility owners to close NGS – and the challenges it creates - reemphasizes the critical nexus between water and energy. Warren Tenney was elected twice to serve as a member of the Central Arizona Project (also called the Central Arizona Water Conservation District or CAWCD) Board from Pima County. He served as Vice-President of the Board and as Chairman of the Board’s Finance, Audit & Power Committee. He resigned his board position in January 2016 to become Arizona Municipal Water User Association’s executive director.